I keep wondering how the combined December/January average for 2016/17 stacks up compared to other years. PDX could hit 50 today. It seems like it should rank up there considering how consistently chilly both months were in many locations. Seems unusual to have a solidly cool December/January back to back. 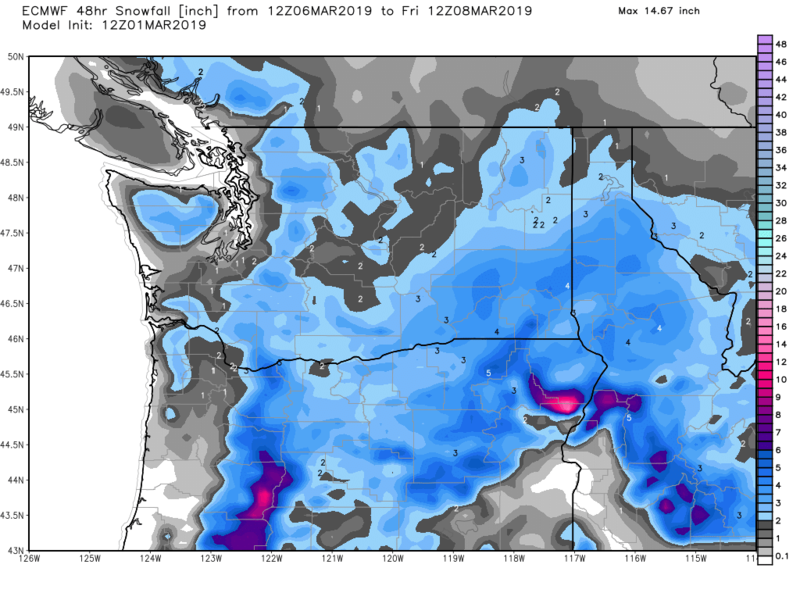 The 12Z EURO still shows an overrunning snow/ice storm for the Willamette Valley on Wednesday morning. Looks like all ice except for PDX Metro. Just a brief look it was the coldest Dec/January combo at SLE since 1984-85. It appears this was the 4th coldest February on record at Medford. Behind only 1956, 1933, 1964. They also narrowly edged out PDX with 6.8" of snow. Inter-hour... lets see if it holds. 12Z ECMWF showed 46 for a high at SEA today. Harts Pass Snotel, WA averaged 12.5 degrees last month. Looks like this was the coldest Feb average at any Snotel or RAWS station in WA state history! The RAWS network went online in 1985, and the Snotel network around 1980. The previous coldest Feb. average was 12.8, at "83 Monument" RAWS in February 1989. For official stations, the Feb. average at Tonasket 11NE COOP was 13.3 degrees - coldest for Feb. at any official WA station since 1936! Narrowly beat out the 13.6 degree average at Twisp 10W in February 1956. In February 1936, a number of stations in eastern WA averaged in the single digits. No idea how you even get a blurry view of this... takes 10 seconds to capture and upload. Yes Jesse has been giving me non stop tutorials the last two days straight. My life is now much enriched due to Jesse saving me from blurry PNA images. I tried just emphasizing on the last month that is why I would zoom in...but whatever. Pretty amazing how warm temps approaching 50 with light wind and early March sun angles feels, especially after the last four weeks. Feels hot out today. TIM!!! We are on the same wave length!! Only 15 degrees from 70 here! My son and I were just sitting on the deck and it felt very warm... even though the backyard is covered in snow still. And even though we personally experienced many days in the low 80s in the last month. My Junipers are still refusing to let the snow go. In late January we had daylilies coming up on our rock wall... which happens to also be where we need to throw the snow from the driveway. So they were buried under several feet of compacted snow at one point. The snow is now melting back from the top of the rock wall and has exposed some of them and they look the same as before it started snowing... green and standing up and ready to continue growing. Some of our bushes don't look so good. Natural pruning I guess. First day in a couple weeks at least above 40 here. 43 for a high. Yeah, for Eugene the EURO has temperatures around 26/27 on Wednesday at 7am with moisture overheard. NWS going for highs of 40 Sunday and 41 Monday at PDX. Would be pretty darn impressive. 53 at SLE, 48 at PDX. I don't think they are going to make it. I heard In-Out-Burger is opening up a location in Keizer. They filed for a building permit back in December. It's about time, their the best. That is gonna be dank. I wonder how much melting has occurred at home today. Probably not as much as I would hope. Feels like July out there today. Tim better start posting the smoke maps! Not as much as I wanted here. Still so much snow on the ground. Beautiful around town. Feels nice. Not gonna last though. Looking forward to being in Arizona next week. Of course we are going immediately to Flagstaff for the first 3-4 days so the weather probably won't be to big of a shock, looks like it's about 45 there today. Then back to Glendale for the rest of the trip. Holding the temps down a little too. Looks like EUG only hit 45 today. About a -9 departure on the high for March 1st. High at SEA was 51. Just saw the EURO and it says good chance they hit 50. ECMWF was 5 degrees too cold for SEA today. Looks like the warm season has begun! It will be 3-5 degrees too cool for SEA on most days in the warm season. Such a beautiful day out there with blazing sunshine on all the snow. Still in awe at how amazing this was. Looks like Troutdale had a high of only 44 today. VUO came in surprisingly colder than PDX with 48. Crazy to think the east wind will just be getting colder from here the next 3-4 days. Who would have ever thought PDX hitting 50 in March would be so potentially upsetting? Don’t project. Just having a little fun, kind of like your wow posts. Andrew is a character. Although granted so am I. Most of us are! Did you see today’s Euro? I was in Victoria today. Looked like the early daffodils were in bloom. Yes. I just about WOW’d myself. I’ve noticed a couple in sheltered spots around town down here the last few days or so as well. Hardy little sh*ts.